WhaleRock Luxury Lodge & Villa boasts stunning lush green gardens and a large pool. 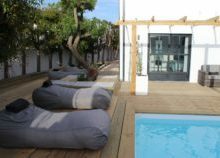 Since December 2017 the new Villa with a second pool has opened it’s doors on the property. Whale Rock is situated one block back from the sea and there is a distant sea view from the entrance garden. Whale Rock is situated across the road from the New Harbour where all Whale Watching Charters board. Walk out of the gate and you’ll find the beginning of the famous Cliff Path which meanders along the stunning Whale Coast of Hermanus. 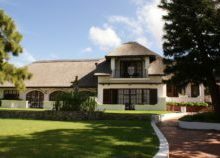 With a total of 17 Luxurious individually decorated Rooms and Suites, two pools, lawns and gardens, WhaleRock Lodge is the perfect retreat for your leisure and/or corporate stay. This cosy room (No. 11) with Twin/King Size bed, has an en-suite bathroom with separate bath and shower and under floor heating in the bathroom. The room has a private patio with thatch roof. 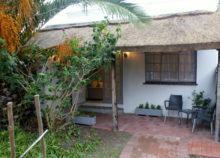 Whale Rock offers five (5) spacious Garden Deluxe Rooms (Room No's 5, 6, 8, 9 and 10). 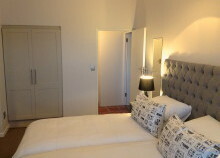 All Garden Deluxe Rooms have a recently renovated/upgraded en-suite bathroom with separate bath and shower. 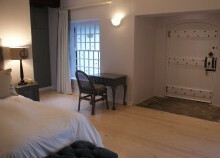 All the rooms also have a semi-private patio or courtyard terrace. 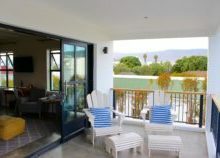 The exception is room 8, where recently a lovely wooden deck was added over the fish pond full of koi and gold fish, in front of the room, looking over the large pool and gardens. 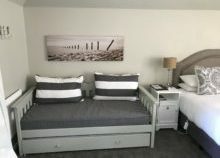 A lovely new loft with 2 singles beds for children under 14, has recently been added to Room 8 which is now also very suitable for a family with 2 children (under 14 years). 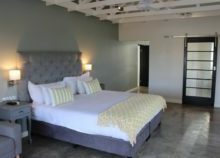 The new Villa @ Whale Rock Lodge, offers two (2) Patio Deluxe Rooms on the ground floor. 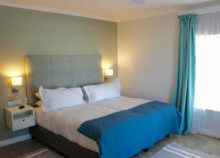 These contempory decorated double rooms come with decorative screed floors, king size bed or twin beds and each has their own en-suite bathroom, with bath and separate shower. Both have a separate entrance and private wooden deck patio. These 2 rooms also combine as the Patio Deluxe Family Suite. 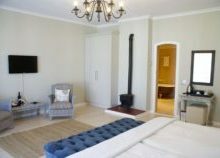 This lovely Suite (No.4 ) with a distant Sea View is a large, beautifully decorated room, with lush carpeted floor, with King Size bed which can be twinned and en-suite bathroom with bath and separate shower. 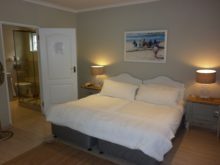 It is positioned on the 1st floor and has a balcony with a lovely distant sea view. The Pool Suite @ the new Villa has 2 floor levels and is located at the back of the Villa and is a seperate building. 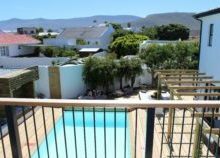 It has a private lounge on the ground floor overlooking the pool and on the 1st floor is the bedroom with a King Size size and en-suite bathroom with shower (no bath) and a large balcony with views over Hermanus. The pool suite has a decorative screed flooring on both floors. The Pool suite is adjacent to the Villa's pool of 8 x 4 meter. 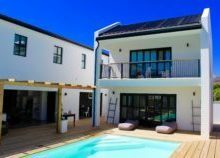 The new Villa at Whale Rock offers three (3) spacious and contempory decorated Suites, named after the stunning and famous Walker Bay in Hermanus. 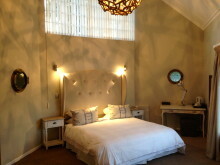 Each of these lovely suites has a King Size size or twin bed and en-suite bathroom with bath and separate shower. These Suites with decorative screed floors, are on the 1st floor at the Villa and all three have a large balcony with great views. 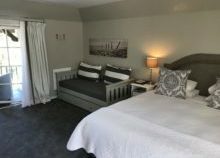 This large sized privately situated Executive Honeymoon Suite ( No. 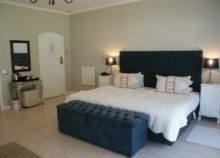 1) boasts of an open bedroom and spacious private lounge with decorative screed floors, a recently renovated luxurious, en-suite bathroom with separate shower & bath, a dressing room/small office. This luxury Suite has a lovely terrace overlooking the large lush green gardens and direct access to the large pool. This Garden Family Suite ( No. 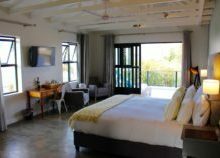 7) is located in the left wing of our main house on the ground floor with a main bedroom and open lounge. 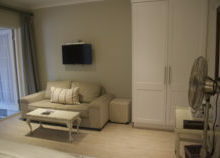 The Suite is te perfect suite for a family of 4. 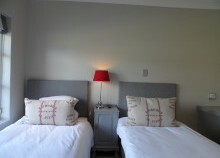 It has a second bedroom with 2 Single Beds for 2 children under 18 years old. 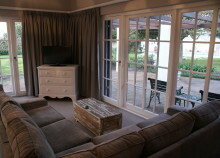 The spacious suite has a private patio with direct access to the garden lawn. 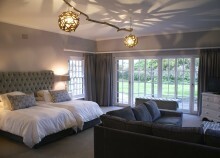 Both bedrooms have direct access to the en-suite bathroom with bath and separate shower. 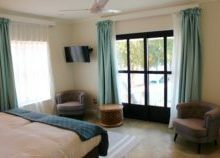 The Patio Deluxe Family Suite in the Villa is a combination of 2 adjacent Patio Deluxe Rooms on the ground floor, connected through interleading doors. The rooms that are interlinked are Room 12 and Room 13. 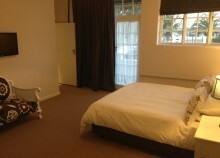 Both rooms have an en-suite bathroom with separate shower & bath. 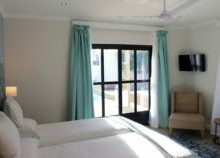 The Patio Deluxe Family Suite can accommodate a family of 4 (4 adults or 2 adults and 2 kids) staying and has got direct access to the deck and the pool @ the Villa from room 12.